Scholarly societies (наукові товариства; naukovi tovarystva). The first learned society in Ukraine was the Odesa Society of History and Antiquities (1839). Learned societies did not become widespread, however, until the last few decades of the 19th century. Most were associations of scholars in the humanities, law, and social sciences, such as the Church-Archeological Society (1872) at the Kyiv Theological Academy, the Historical Society of Nestor the Chronicler (1873) at Kyiv University, the Kharkiv Historical-Philological Society (1877), the Kyiv Juridical Society (1877), the Odesa Historical-Philological Society (1889), the Nizhyn Historical-Philological Society (1894), the Volhynian Church-Archeological Society in Zhytomyr (1894), the Kyiv Society of Antiquities and Art (1897), the Podilia Church Historical-Archeological Society in Kamianets-Podilskyi (1903), and the Kyiv Society for the Preservation of Ancient and Artistic Monuments (1910). 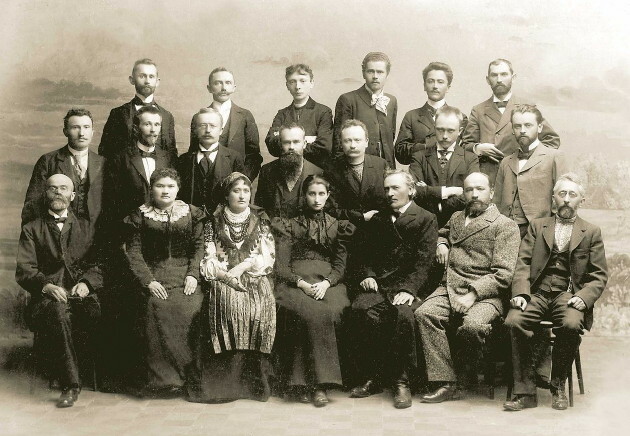 In regional studies the first associations were the Society of Kuban Researchers in Katerynodar (1896), a similar one in Katerynoslav (1901), and the Volhynia Research Society in Zhytomyr (1900). In 1907 the Ukrainian Scientific Society was founded in Kyiv to unite all scholars in Russian-ruled Ukraine. It modeled itself on the important, multidisciplinary Shevchenko Scientific Society (NTSh, est 1873), to which most Ukrainian scholars and scientists in Austrian-ruled Galicia belonged. Other societies in Galicia were the Halytsko-Ruska Matytsia (1848), the Society of Friends of Ukrainian Scholarship, Literature, and Art (1904), and the Society of Ukrainian Lawyers (1909). In the natural sciences the first associations were the university-affiliated Kyiv Society of Naturalists (1869), Kharkiv Society of Naturalists (1869), and Odesa Society of Naturalists (1870); they were followed by the Kharkiv Physics and Chemistry Society (1872), the Kharkiv Mathematics Society (1879), the Kyiv Physics and Mathematics Society (1890), and the Kyiv Physics and Chemistry Society (1910). In Galicia some Ukrainians belonged to Polish, historical, philological, anthropological, and naturalists' societies. Many scholars in Russian-ruled Ukraine also belonged to imperial societies, such as the Free Economic Society (1765), the Moscow Society of History and Russian Antiquities (1805), the Saint Petersburg (1846) and Moscow (1864) archeological societies, the Russian Historical Society (1866), the Saint Petersburg Military History Society (1907, with branches in Kyiv and Odesa), and the Imperial Russian Geographic Society (1845). The Southwestern Branch of the Imperial Russian Geographic Society was a center of Ukrainian scholarship in 1873–6. After the Revolution of 1917 most active scholarly societies were affiliated with universities or other postsecondary institutions. Under Soviet rule most of them became part of the All-Ukrainian Academy of Sciences (VUAN) network. In 1928 the VUAN societies were the Historical Society of Nestor the Chronicler and the Ukrainian Scientific Society in Kyiv, which became affiliates in 1920; the History of Literature (1922) and Pedagogical societies in the VUAN Historical-Philological Division; the Geological Society (1918) and the Ukrainian Botanical Society (1919) in the VUAN Physico-Mathematical Division; and the Society of Economists (1919) and Society of Ukrainian Jurists (1921) at the VUAN Social-Economic Division. Outside Kyiv other societies (most of them based on prerevolutionary societies) functioned as VUAN branches. They included the Poltava Scientific Society (1918), the Lubny Scientific Society (1920), the Kharkiv Scientific Society (1924), the Dnipropetrovsk Scientific Society (1924), the Kamianets-Podilskyi Scientific Society (1925), the Odesa Scientific Society (1926), and the Shepetivka Scientific Society (1926); the Oster (1924) and Nizhyn (1927) scientific regional studies societies; the Cabinet for the Study of Podilia (1924) in Vinnytsia; the Odesa Regional Studies Commission (1920); and, outside Ukraine, the Leningrad Society of Researchers of Ukrainian History, Literature, and Language (1922). All of these societies had their own publications. Non-VUAN societies were also active in the first years of Soviet rule, particularly in the natural, medical, and technical sciences. The Kharkiv Medical Society (1925), with its 16 sections, was prominent among them. In other areas notable associations were the Kharkiv Juridical Society (1923) and the All-Ukrainian Ethnographic Society (1924) in Kyiv, the Military Sciences Society at the general staff of the Ukrainian Military District, the Donbas Scientific Society (1926) in Luhansk, and the All-Ukrainian Learned Association of Oriental Studies (1926), All-Ukrainian Association of Physicists (1926), Ukrainian Society of World Studies (1928), and Ukrainian Physiological Society (1928) in Kharkiv. In the field of regional studies local societies were created in Ananiv, Bila Tserkva, Berdiansk, Dnipropetrovsk, Konotop, Luhansk, Poltava, Proskuriv, Tulchyn, and Zinovivske. In 1930 there was a total of 44 scholarly societies in Soviet Ukraine. In Polish-ruled interwar Western Ukraine the only new scholarly society established was the Ukrainian Theological Scholarly Society (1923) in Lviv. The Shevchenko Scientific Society continued to unite most Western Ukrainian scholars until 1939. During the Stalinist terror of the 1930s most societies in Soviet Ukraine were liquidated by the Soviet regime. The same fate befell the Galician societies during the Soviet occupations of 1939–41 and 1945. In Hungarian-occupied Transcarpathia (1941–4) the Subcarpathian Scientific Society was active. After 1945 all newly established Soviet Ukrainian societies functioned as republican branches of the all-Union geographic (see Geographic Society of the Ukrainian SSR), botanical, microbiological, entomological, physiological, biochemical, hydrobiological, paleontological, mineralogical, chemical, medical, and other societies. The popular-scientific Znannia Society of the Ukrainian SSR was also a branch of an all-Union counterpart. Only the Ukrainian Republican Scientific Society of Parasitologists (1945; nine branches), the Ukrainian Society for Nature Conservation (1946), the Pedagogical Society of the Ukrainian SSR (1960), and the Ukrainian Society for the Protection of Historical and Cultural Monuments (1966) had independent republican status. Independent of all-Union and republican organizations were the Lviv Geological Society, the Kharkiv Mathematics Society, and the Odesa Archeological Society. 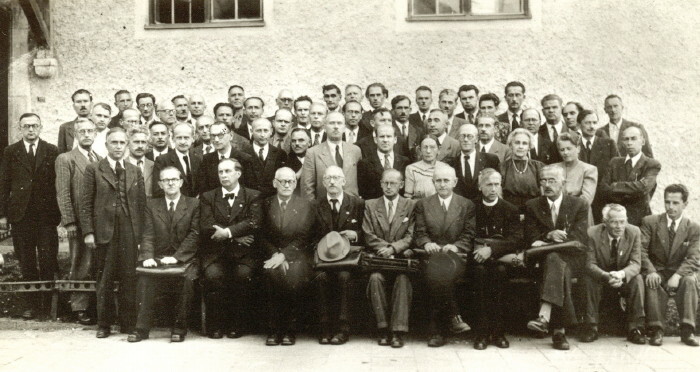 Ukrainian émigré scholars in Bohemia (and Czechoslovakia in general) during the interwar period established the Ukrainian Historical-Philological Society, the Ukrainian Law Society, the Ukrainian Pedagogical Society in Prague, the Ukrainian Physicians' Association in Czechoslovakia, the Ukrainian Society of Bibliophiles in Prague, the Union of Ukrainian Engineers' Organizations Abroad, the Ukrainian Scholarly Association, and other societies. Scholars in Poland created the Ukrainian Military History Society. After the Second World War émigré societies functioned only in the West. They included the revived the Shevchenko Scientific Society and the Ukrainian Theological Scholarly Society, the Ukrainian Academy of Arts and Sciences in the US and Canada, the Scholarly Theological societies of the Ukrainian Orthodox Church of Canada (Winnipeg) and the Ukrainian Orthodox Church in the USA (South Bound Brook, New Jersey), the Ukrainian Academic Society in Paris, the Research Institute of Volyn, and the Ukrainian Historical Association. Scholarly work has also been conducted by the Ukrainian Medical Association of North America, the Ukrainian Veterinary Medical Association, the Ukrainian Engineers' Society of America, the Association of Ukrainian Lawyers, the Ukrainian Library Association of America, and other professional émigré associations.